At your child's latest dental visit, you found out one of their primary (“baby”) teeth has become decayed and in danger of loss. Of course, you may think, it's only a primary tooth — it's going to come out sooner or later. But a primary tooth lost “sooner” rather than “later” can create long-term negative consequences for your child's dental health. For the sake of the future permanent tooth, the best treatment strategy could be to put forth the effort and expense to save it. Besides its role in eating and chewing, a primary tooth's most important function is as a “trailblazer” for the permanent tooth developing below it. A primary tooth doesn't normally loosen and let go until the new permanent tooth is ready to erupt. Until then they hold the new tooth's space in the jaw. But if the primary tooth is lost prematurely, nearby teeth can drift into and crowd the space so that the permanent tooth comes in out of position. This can result in a malocclusion, or poor bite. Depending on the state of your child's jaw development, it may be advisable to attempt saving the tooth through a filling or, in the case of deep decay, a modified root canal treatment. 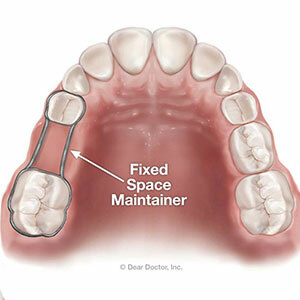 If the tooth can't be saved, then placing an orthodontic appliance known as a space maintainer might be necessary. Cemented to a tooth next to the empty space, this appliance has a looped band of metal that butts against the tooth on the other side of the gap, and prevents both teeth from drifting into the space. Intervening for a decayed primary tooth can seem a waste of time and money since it has a limited lifespan to begin with. But for the health of its companion permanent tooth, as well as possibly avoiding orthodontic treatment, it could be well worth it for your child's long-term dental health.